For me, tofu has been an acquired taste and texture. Sure, it takes on the flavor of whatever its marinade is, but texture-wise, it still gave me the willies. I always would just eat it (quickly) because it was good for me. Because of this you can see how easily I feared the popular tofu scramble. I’d had it once in San Francisco, and while good, the scramble didn’t leave me with that “Oooooh!” feeling the next time “tofu scramble” was mentioned. In fact, I still had a somewhat instant repulsion. D wanted to make it one night for dinner, and my reply was “You know, it’s really easy to mess up a tofu scramble.” Silly me. She’s a great cook, and I had faith in her, just none in my belief that I’d like another tofu scramble. D read somewhere that if frozen and then allowed to thaw prior to preparation and being cooked, tofu gains this wonderful, delightful texture. And, wow, was that advice correct! I no longer have the inner monologue of “Just eat it and get it over with quickly!” I actually look forward to dishes containing tofu. 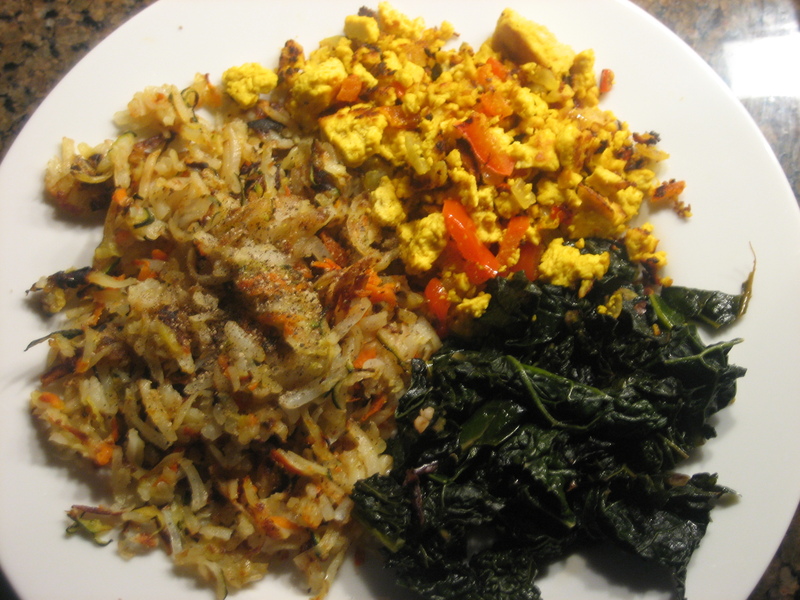 So, she made the scramble, along with homemade hash browns and sautéed kale, and MMMM! Delish! See for yourself. The love didn’t stop there. 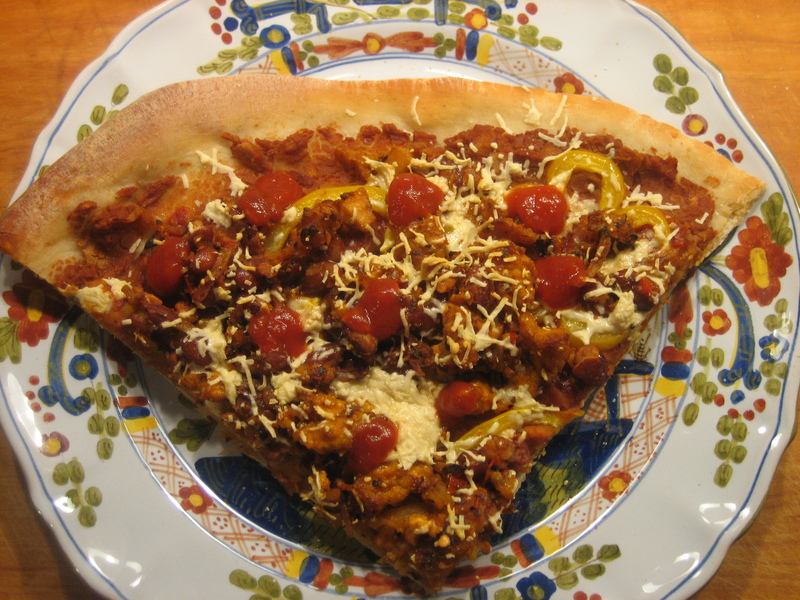 The next night, we had left over scramble, but D had the brilliant idea to morph it into a Mexican-style pizza. Abso-freakin’-lutely, amazingly yummy.